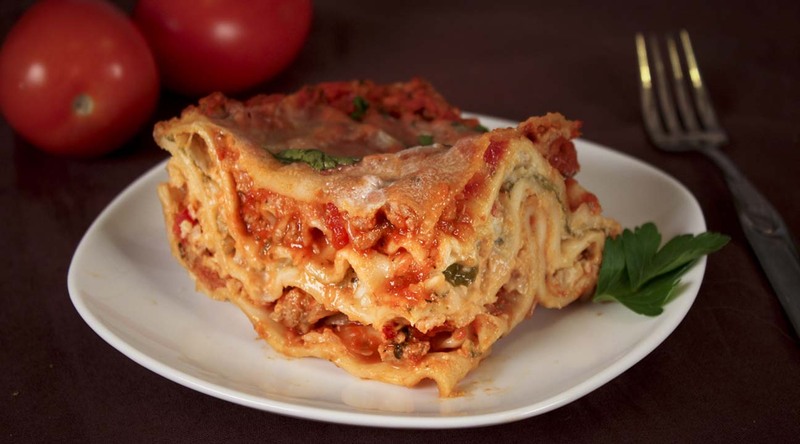 Packed with flavor, our Spicy Lasagna is always a big hit! All of our guests know that we never cook anything boring. We infuse everything we make with tons of flavor, no matter what cuisine we’re creating. So when we make lasagna, we liven up layers of baked pasta with our zesty arrabbiata sauce. Now you can too! Preheat oven to 375°F. Spray baking pan (about 13 x 9 x 3-inches deep) with non-stick cooking spray. Remove 16 lasagna sheets from box. Do not boil. In medium bowl, beat eggs. Stir in ricotta, 2 cups of mozzarella and the Parmesan. Spread 1 cup of sauce on bottom of baking pan. Layer 4 uncooked sheets, 1/3 of ricotta mixture, half of browned meat, 1 cup of mozzarella, and 1 cup of sauce. Layer 4 uncooked sheets, 1/3 of ricotta mixture, and 1 cup of sauce. Layer 4 uncooked sheets, the remaining ricotta mixture and browned meat, and 1 cup of sauce. Layer 4 uncooked sheets, the remaining sauce, and remaining 1 cup of mozzarella. Bake, covered with foil until bubbly, 50-60 minutes. Uncover and continue cooking until cheese is melted, about 5 minutes. Let rest 15 minutes before cutting. I was wondering where to get or how to make this sauce? Hi Andrea! We featured the arrabbiata sauce recipe in our previous post. You’ll also need the basic marinara sauce recipe, which was featured previously too. We hope you enjoy them. Let us know what you think.